The human rights abuses of the Kingdom of Saudi Arabia are not secrets. A monarchy under Islamic Law, with only rare and arbitrary local elections, and almost total subjugation of women, the West looks on with disapproval, but impotence. They are, infamously, a U.S. “ally,” being a huge source of oil and perceived as a bulwark against Islamic terrorism in an unstable region of the world. We see the oppression, the medieval treatment of half its population, and the astounding opulence of its aristocracy, and we shrug. It’s their culture; what can we do? While Saudi Arabia seems somewhat untouchable from the outside, what is less well known is that, within its borders, there are strong and courageous individuals and groups who exert great effort and take enormous risks to organize and agitate for reform. But just as Saudi Arabia does not tolerate its women to show their faces, nor does it countenance political or religious dissent in any form. Through diplomatic efforts, grassroots organizing, and public demonstrations, we’ve worked on cases such as that of Alexander Aan in Indonesia, beaten by a mob and jailed for espousing his atheism on Facebook; the atheist bloggers of Bangladesh, several of whom were arrested for “insulting religion”; the recently-freed Meriam Ibrahim of Sudan, a young mother sentenced to death for marrying a Christian man and refusing to convert to Islam; and many others. Far too many others, really. We could never hope to even catalogue them all, let alone help them all. Saudi Arabia, however, has been a major focus of ours in recent months, and thanks to their own defensiveness, they’ve actually helped us to shine an ever-brighter spotlight on their suppression of free speech and belief. In 2012, liberal Saudi activist Raif Badawi, founder of a website for open discussion of religious, political, and social issues, was arrested for insulting Islam, and for apostasy, the latter of which is punishable by death. More than a year later, a court found him guilty of insulting Islam and “showing disobedience,” and sentenced him to six years in prison and 600 lashes. You read that correctly, six hundred lashes. With a whip. The charge of apostasy was dropped for the time being, but after a review almost another year later, a higher court actually increased his sentence to 10 years and 1000 lashes. He has been in prison for over two years now, awaiting his fate. His wife recently fled with their children to Canada, where she presses for international intervention on her husband’s behalf. Suffice it to say, Raif Badawi no longer has Waleed Abu al-Khair to represent him. It is the plight of these two victims of persecution — guilty of nothing more than speaking their minds, believing as they wish, and seeking a way to a fairer and freer Saudi Arabia — that CFI chose as their focus for its statement to the United Nations’ Human Rights Council on June 23, 2014. CFI is one of many NGOs that have “consultative status” at the UN, and we frequently speak out on issues regarding free expression and belief, and the persecution of believers and nonbelievers alike. Our chief UN representative, Michael De Dora, was recently elected president of the UN’s NGO Committee on Freedom of Religion or Belief, and works alongside our allies in the NGO community, such as the International Humanist and Ethical Union. CFI has UN representatives in New York and Geneva, where the Human Rights Council convenes. 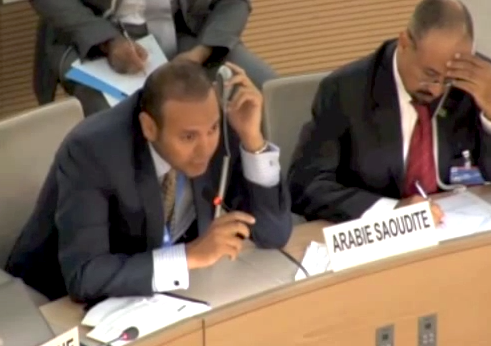 CFI planned to deliver a short and impassioned statement to the Human Rights Council, through our representative Josephine Macintosh, forcefully condemning Saudi Arabia’s persecution and imprisonment of Badawi and al-Khair, demanding that all charges against them be dropped, and that they be immediately freed. What made this doubly powerful was that Saudi Arabia has itself recently became a member of the Human Rights Council, an irony not lost on many. Brian Pellot, the human rights reporter for the Religion News Service, rightfully called their election to the Council “a disgrace.” Be that as it may, members they are, and on this particular Monday, Saudi representatives were there in the room to hear themselves be condemned for their oppression. Even more remarkable was the show of solidarity from not one but four member states of the Council. Lead by the United States’ representative, the right of Macintosh to give her statement was subsequently supported by Ireland, Canada, and France. (Canada’s religious freedom ambassador Andrew Bennet later said on Twitter, “Proud that Canada defended @center4inquiry right to speak in Human Rights Council on Raif Badawi case today.”) Council Vice President Kateřina Seqeunsova ultimately sided with Macintosh, and indeed, repeatedly tried to do so. It was a sight to behold. As an elected member of this Council, Saudi Arabia is obliged to “uphold the highest standards in the promotion and protection of human rights” and “fully cooperate with the Council”. If it is to retain any credibility as a member, we urge it to reform its laws so as to protect freedom of religion, belief, and expression, cease the use of corporeal punishment, and repeal Article 1 of its interior ministry’s decree defining atheism as terrorism. This is perhaps what upset the Saudis most, that a statement from a relatively small organization of infidels was able to call them out before the eyes of the world for lacking credibility. We named them as blatantly unworthy of even being in that room. The world noticed. Will they continue to shrug? We certainly aren’t going anywhere. For Raif, for Waleed, for their families, and for the countless others being crushed for their voices and their thoughts, our spotlight will ceaselessly shine directly into the faces of the oppressors until the intensity of the light, and the heat of the gaze of the civilized world, become too much for them to bear. Christian Preacher Explains Why Watching Game of Thrones is Like "Recrucifying Christ"